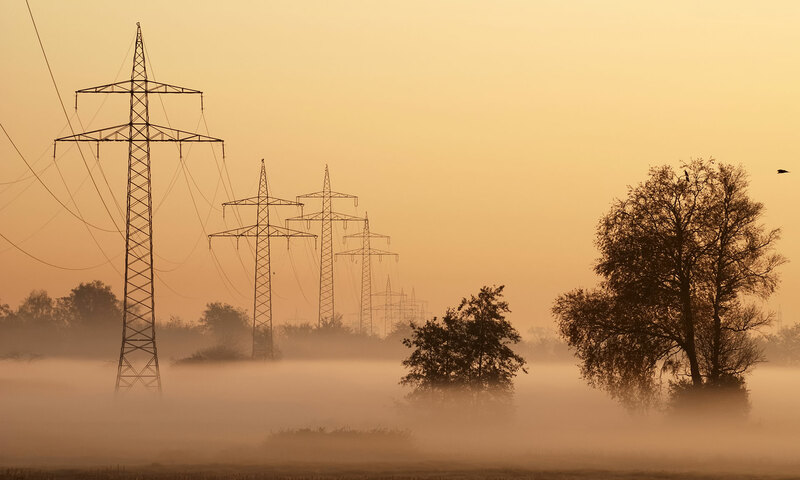 One of the cheapest energy deals this month is from one of the Big Six firms – something we’ve seen infrequently this year. 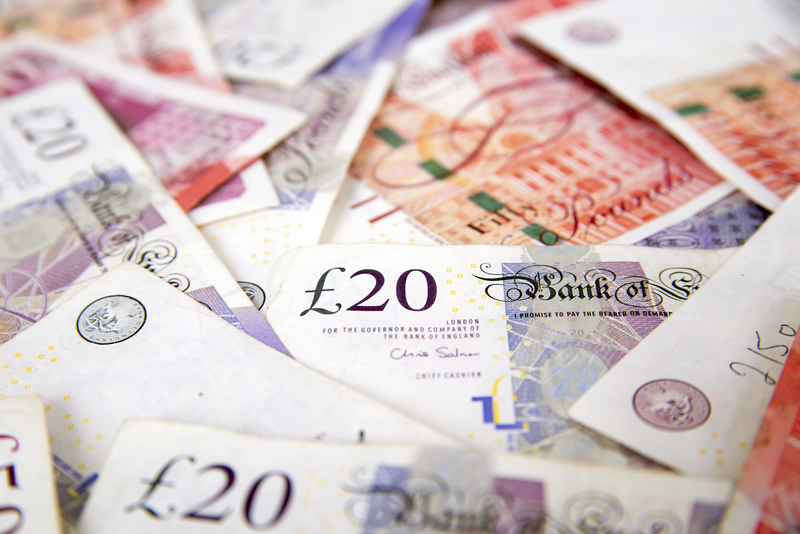 You can save £378 per year with the best deal but these savings might not be around for long. 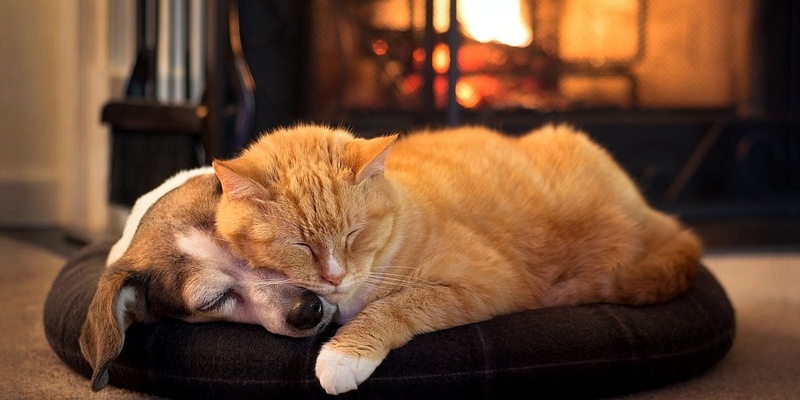 Use our research to find the best tariff to keep your family cosy in the run-up to Christmas. The biggest savings are available to those switching from the default or standard tariff of one of the Big Six firms. If you’re reluctant to leave the safety of big firms in the wake of several smaller suppliers going bust, one of the cheapest deals in December is from Eon. Which? Recommended Provider Octopus Energy is also selling one of the best value tariffs. All of the five cheapest deals this month are fixed tariffs and all bar one fix your prices for a year. The cheapest deal, however, is 18-months long. The price cap will cut the prices of default and standard deals from January. This will likely mean that the amount you can save by switching from them will be less. Read on to see the top five cheapest tariffs and find out which cheap suppliers have gone bust. Or get started and compare gas and electricity prices using Which? Switch to find the best energy deal for you. You can call us on 0800 410 1149 or 01259 220235. The cheapest deals for December, available across England, Scotland and Wales, are a guide to what you could be spending in a year on energy, if you use an average amount. Your exact spend will depend on how much gas and electricity your household uses. 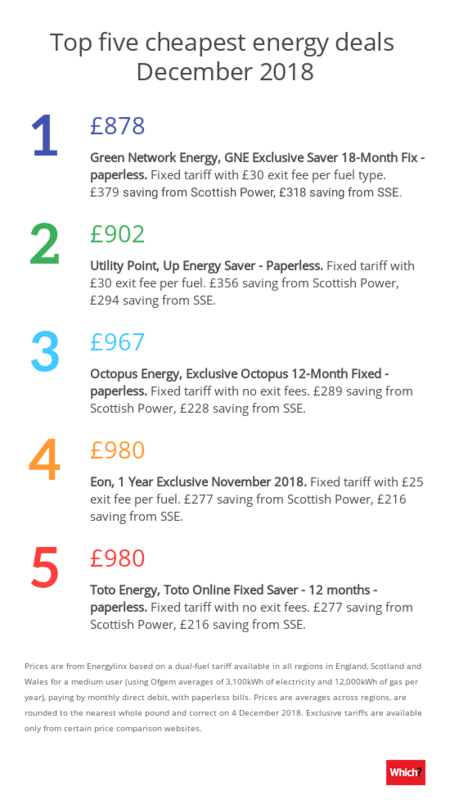 We’ve given annual prices, plus the tariff name and how much it would save someone switching from SSE or Scottish Power’s standard variable or default tariffs per year (respectively the cheapest and priciest of the Big Six firms). Two of the tariffs have no exit fees meaning you can leave early without paying a penalty if you find a better deal. Though these tariffs will give you the biggest savings, they’re pricier than this time last year. Then, the cheapest deal cost a medium user £40 less per year. Since then, wholesale prices have risen, plus energy firms are under pressure to install smart meters and bring their prices beneath the price cap, which will come into force in January 2019. At present, the priciest default variable tariff from all suppliers costs £1,386 per year so will have to be cut from the beginning of 2019. Some of the cheapest deals in previous months have been sold by companies which have since gone bust. For example, Iresa’s tariffs were among the cheapest in summer and autumn 2017. It went bust in August 2018. Just because a company is selling good value tariffs does not mean it is in financial trouble. Check Which? 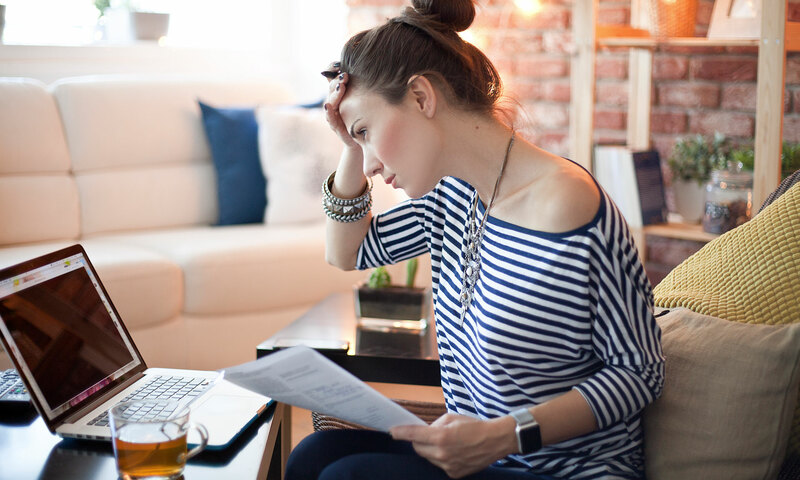 ratings to see which companies are best-rated by their customers and look out for customer complaints about sudden increases in direct debits, or investigations by energy regulator Ofgem. If you haven’t changed supplier before, find out how to switch energy supplier. Electraphase called in administrators in July. Extra Energy had 108,000 customers who rated it poorly in our most recent survey. It stopped trading in November. Future Energy had around 10,000 customers, mainly in Newcastle, until it stopped trading in January. Gen4u stopped selling energy in September owing to financial difficulties. It had just 500 customers. Iresa stopped trading whilst it was under investigation by the regulator for its customer service and banned from taking on new customers. Snowdrop Energy said that continued increases in wholesale prices led to it transferring its customers to its parent company in October. 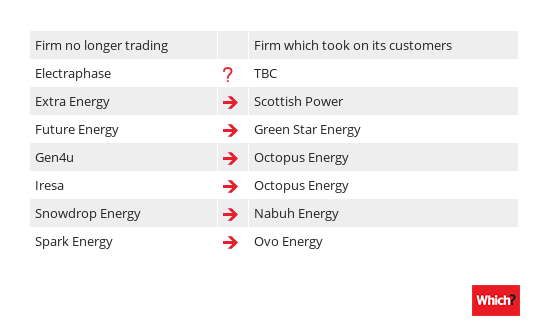 Spark Energy was the biggest firm to go bust this year, in November. It had 290,000 customers and the brand will continue to exist, but backed by another supplier. What happens if my energy company goes bust? If your energy firm stops trading, your supply won’t be cut off. First of all, take meter readings. You’ll need these to confirm how much gas and electricity you have used when you move to a new firm. A new energy supplier will be chosen for you by energy regulator Ofgem. It runs a competitive process to find the best supplier it can to take on customers of the failed supplier. The new supplier is often announced within a week; it will then contact you and you’ll be switched over within a couple of weeks. New suppliers have sometimes honoured customers’ existing tariffs, or put them on their best deal. When the new supplier contacts you, make sure you ask for its best deal, or you can switch if you’ve found a cheaper one elsewhere. You won’t be charged any exit fees. If you’re in credit, it’s safe and will be used to pay for your future energy use. Find out more: know your rights if your energy company goes bust. Energy usage is based on Ofgem’s annual average figures for a medium user (12,000kWh gas and 3,100kWh electricity). Data is from Energylinx. Prices given are averages across regions, are rounded to the nearest whole pound and correct on 4 December 2018.